Your Multivitamin or Nutritional Supplement. 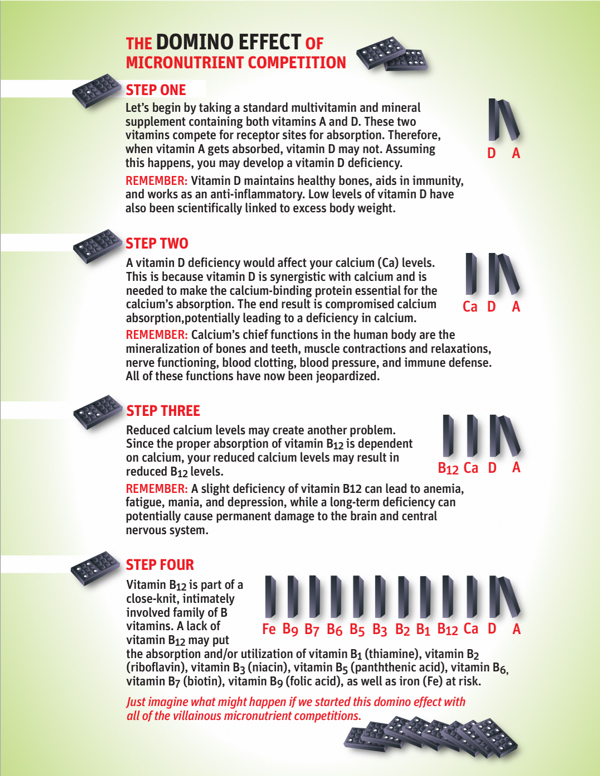 Each micronutrient, whether essential or nonessential, vitamin or mineral, differs in form, function and in the amount needed by the body to produce or maintain our individual health. They are absorbed by the body by attaching to receptor sites, or absorption pathways, which act as docking locations for specific micronutrients. These receptor sites are found throughout the entire gastrointestinal tract. For the most part, the majority of micronutrients are absorbed in the small intestine. However, due to something called micronutrient competition the process of absorption can be more like an epic battle scene than a harmonious event. Unfortunately, most supplements companies simply overlook this battle (competition) for absorption during the formulation process of their multivitamins and nutritional supplements. Science has shown that there are four types of competition that can occur between micronutrients, they are chemical, biochemical, physiological, and clinical competition. Research published in the American Journal of Clinical Nutrition (AJCN), the British Journal of Nutrition (BJN), the Harvard Health Letter as well as many other nutritional and medical based peer-reviewed journals shows that competitions for absorption occur between many of the vitamins and minerals typically found in popular multivitamins. This makes it so that unless specially formulated to prevent micronutrient competition, many of the vitamins and minerals in the typical multivitamin and/or nutritional supplement are simply not absorbed. As you can see, micronutrient competition can greatly reduce your body’s ability to absorb the vitamin and minerals in the typical multivitamin or nutritional supplement. 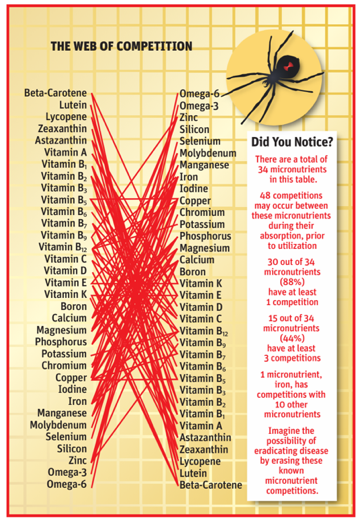 In fact, nearly 90% of the common micronutrients evaluated above are affected by micronutrient competition in some way. To make matters worse, when key micronutrients don’t get absorbed, the ability of other micronutrients to perform specific functions in the body can be greatly diminished or even eliminated. We call this the domino effect. Regardless of which kind of the four types of micronutrient competition is present, taking a supplement that is not formulated to eliminate these competitions can be like throwing money down the toilet and can leave you vulnerable to micronutrient deficiency. 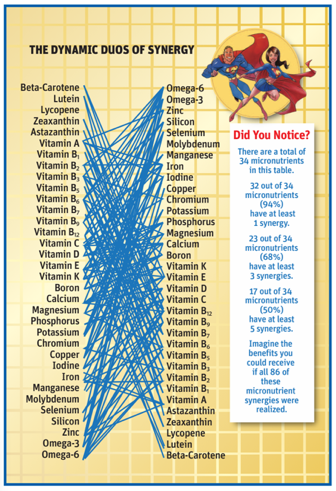 It turns out that micronutrient synergy is like a mirror image of micronutrient competition. While micronutrient competitions can reduce or eliminate the beneficial effects of certain micronutrients, micronutrient synergies can enhance the beneficial effects of certain micronutrients. However, and this is important, micronutrient synergies cannot reverse or eliminate the effects of micronutrient competitions on their own; they can only offer enhanced absorption and utilization if all of the micronutrient competitions that could affect their absorption have been eliminated. Is your multivitamin stuck in the past? While the multivitamin is found in almost every home in America, most people don't know its history. First introduced in the 1930's, the multivitamin is still manufactured today using much the same technology as its original prototype. Even though science now understands much more about vitamins than it did back in the early 20th century when they were first discovered, most supplement manufacturers continue to throw them together in their multivitamin and nutritional supplements regardless of known competitions. Unlike the telephone, which has evolved since the 1930's from an antiquated wall-bound talking machine to a handheld personal computer/phone/ipod today; or the television that has gone from a small 13 inch screen, with a black and white picture and manual dial control to a 50 inch, flat screen entertainment center with 3D capabilities, unlimited movie access and voice control; most multivitamins are still stuck in the past. Anti-Competition™ Technology (ACT) – Bringing The Multivitamin Into The 21st Century! The invention of Anti-Competition™ Technology by Calton Nutrition founders, Dr. Jayson and Mira Calton has changed the world of supplemental science forever by greatly enhancing the likelihood of micronutrient absorption and providing a clear pathway for the true benefits of all micronutrients to be realized. First introduced in their book Naked Calories (Changing Lives Press 2012) Anti-Competition™ Technology is a scientific breakthrough in the formulation of multivitamin/nutritional supplementation. The Calton's created this new technology through their identification of over 45 micronutrient competitions that science has shown to reduce the absorption, metabolization and/or utilization of individual micronutrients when combined in a typical multivitamin or nutritional supplement. Anti-Competition™ Technology works by separating competing micronutrients into different formulas to be taken at different times of the day in order to eliminate all of the competitions between them, thus greatly increasing the absorption, metabolization and/or utilization of the individual micronutrients. Just as antibiotics work to eliminate the dangerous effects of certain bacteria, Anti-Competition™ Technology eliminates the negative effects of micronutrient competition. Nutreince™, by Calton Nutrition is the first and only multivitamin in the world to be formulated using Anti-Competition™ Technology to unlock the health enhancing power of the micronutrient.